Educational Leadership program student Laura Williams, center, brings educational best practices into classrooms around Iowa, like Ross Allsup’s fifth-grade class at Danville Elementary in Danville, Iowa, shown here. Williams learned these practices at the UI College of Education. Photo by Tim Schoon. Laura Williams is a strong proponent of “authentic learning,” a relatively new term used to describe curriculum that teaches material by applying it to situations students might encounter in future careers—an approach also known as work-based learning. She is one of two leaders creating the Iowa Authentic Learning Network, a network of Iowa school districts and business partnerships that aims to connect students with employees in businesses that apply the science, math, and engineering being taught in the classroom. Williams, who earned a master’s degree from the University of Iowa College of Education in 2013 and is working on a second master’s in the college’s Educational Leadership (EL) program, is a 21st century-learning specialist and a work-based learning coordinator. She lives in Mount Pleasant, Iowa, and considers the Great Prairie Area Education Agency (AEA) her home base. Since earning her first master’s degree from the UI, she has taken a leading role in two statewide education initiatives, the first helping develop curriculum for Iowa’s new science standards in 2015, and now the Iowa Authentic Learning Network. Because so much of what she does is new to Iowa schools, Williams says she essentially helped create her own position. And because of her expertise in the latest educational standards and best practices, she’s in high demand. The UI College of Education works to maintain the state’s education excellence by training future education leaders in the latest research-supported best practices. Those best practices reach classrooms across the state; every county in Iowa is home to at least one UI-trained teacher or administrator. Iowa offers the fifth-best K–12 education in the nation, according to U.S. News & World Report, which considers teacher training, testing comparisons, and rates of graduation. As part of her duties for the Great Prairie AEA, Williams trains other teachers how to implement authentic-learning curriculum and other educational practices she learned at the UI. One such practice is Argument-based Strategies for STEM-infused Science Teaching (ASSIST), developed by Mark McDermott, clinical professor in the College of Education. In 2015, Williams implemented ASSIST in a middle-school classroom at Mount Pleasant Community Schools, and when Williams developed curriculum modules for the state’s new science education standards, she included McDermott’s ASSIST approach. In addition, she has taught it to teachers across Iowa. Williams says her experiences at the UI are what compelled her to return to earn additional degrees. Although she is working full time, she will complete her master’s from the EL program in spring 2019. At that time, she will have earned three degrees from the UI, the first being her BA in interdepartmental health studies with an emphasis on multidisciplinary sciences, which she earned in 2010. The UI’s EL program is offered online as a partnership between the College of Education and Distance and Online Education, and many of the classes are offered online so students can earn their degree while working full time. The program recently was ranked No. 5 in the nation by U.S. News & World Report in its 2019 Best Online Programs rankings. Williams says she was drawn to the UI and the EL program for their rigor and the opportunity to continue learning about the latest research in educational practices. Steven M. Triplett, clinical supervisor and program coordinator in the College of Education, says that one of the EL program’s strengths is that the majority of its instructors are practicing, successful school administrators. Students in the EL program not only receive the most up-to-date education, they are learning from people using best practices successfully in schools. Triplett himself has been involved in Iowa education for more than 40 years, and served Iowa schools as a teacher, principal, and superintendent. 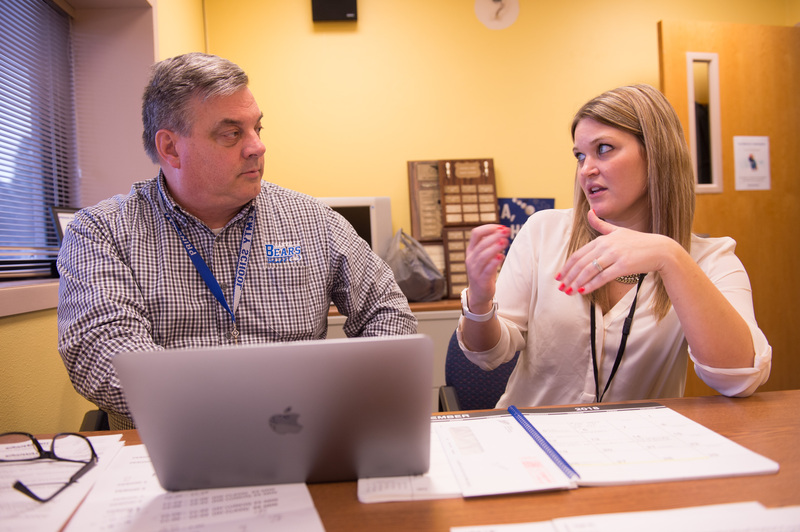 Educational Leadership program student Laura Williams, right, meets with John Lawrence, left, principle of Danville Junior/Senior Highschool in Danville, Iowa, as part of her clinical hours. She’s there to learn from Lawrence about school administration and undertake a project to support the school. Photo by Tim Schoon. Instead of balancing work and study, Williams has used the EL program’s flexibility to combine the two. The EL program requires participants to complete 400 clinical hours—which is more than the average for programs of this kind—by working with teachers and administrators at Iowa schools. Williams does this as part of her job as well, and since she began the program, she’s been able to take what she learns in her online classes and apply it in the field with minimal tweaking. For example, Williams recently coordinated a partnership between Danville Elementary in Danville, Iowa, with a nearby group of engineers from ABB, an international technology company specializing in electric utilities and industrial automation. Williams worked with Ross Allsup, a fifth-grade teacher at the school, to bring ABB engineers into his classroom and talk about engineering problems they face. After this talk, Allsup’s 10- and 11-year-old students worked in teams to complete a worksheet on project management modeled on the challenges discussed by the ABB engineers. After completing the EL program, Williams will be licensed to become a school principal, but she’s not sure that’s what she wants to do. She says she feels compelled to create change and generate opportunities for kids, and right now she’s most interested in creating more partnerships like the one between Danville Elementary and ABB. She thinks the Iowa Authentic Learning Network will help her do that for students across the state.